Materials we commonly work with. Click on the materials below to learn more. ELECTRICAL GRADE: Plastics for electrical applications. Plastics are good electrical insulators. There are dozens of polymers to choose from that offer high dielectric strength and excellent fire resistance. A composite sheet material that consists of electrical grade phenolic resin impregnated into layers of linen fabric. Some would consider ABS the workhorse of engineering grade thermoplastics. Although pricing for ABS is higher compared to some commodity materials such as Polyethylene, ABS tends to be one of the cheaper engineering grade plastics and gives decent physical properties at its price point. ABS is easy to thermoform and is readily available in stocked sheets. Thermoformed products typically made from ABS include: dashboards, instrument clusters, machine covers, tractor hoods, children’s toys, luggage, and panels for refrigerators. Disadvantages – Cost (in some cases), UV instability, Susceptible to degradation with additional heat histories, Moisture absorption, Cold weather impact performance. Because ABS by itself is not a naturally UV stable material, it requires the introduction of a UV stabilizer into the resin mixture or requires a UV stable material to be adhered to the top of the ABS sheet. In vacuum forming applications, this layer must also be thermoformable. Acrylic is generally the material most thermoformers choose to cap their ABS sheet with to make it UV stable. The acrylic cap layer can be produced in a thin film typically called Korad® that is laminated on the ABS sheet. If increased scuff resistance or a deeper sheen or depth of image is required, a thicker sheet often referred to as Solarkote® can be coextruded as a cap layer in conjunction with the ABS. Unfortunately, this thicker layer of acrylic will also have a negative impact on the impact properties of the sheet as a whole and causee the sheet to become a little bit more notch sensitive. Acrylic capped ABS will provide an inexpensive layer of UV protection and will also help with scuff resistance. Korad® is available as a clear material as well as many different standard colors. Solarkote® is a thick layer of acrylic that adds more UV protection to the substrate than is offered by Korad®. Solarkote® offers more scuff resistance and also adds more sheen or a deeper, richer look to the part it is capped with. We can also use other materials such as ASA (Acrylonitrile Styrene Acrylic Ester) to cap ABS with to make the finished part UV stable. Acrylic or polymethyl methacrylate is commonly found in many items that you see and use every day, and it’s often used as a substitute for glass. Acrylic is easily painted and fabricated and is available in many different stocked sizes, shapes and colors. It’s generally used to manufacture products such as signs, product displays, light diffusers, fake fingernails, car light lenses, and aquariums. Acetal or Polyoxymethylene (POM), commonly known under DuPont's brand name Delrin®, is an engineering thermoplastic. It is a lightweight, low-friction and wear-resistant material with good physical and processing properties. Nylon is a popular synthetic material that has many advantages, including being resistant to heat, and very few disadvantages, including easily losing its shape. 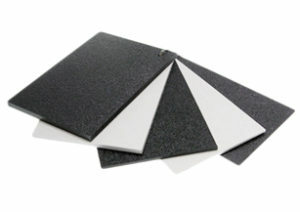 It is used in many items, such as clothing, carpet, storage containers, and more. Nylon has lengthy durability. Polycarbonate typically goes by the more familiar trade name of Lexan™ . Polycarbonate is available in many different stocked shapes, sizes and colors and is also available as a clear material. Polycarbonate is used in many different industries, from medical to automotive and many in between. Polycarbonate is used to make theremoformed products such as: skylights, bulletproof windows, industrial guards, eyeglasses, game housings and hockey rink partitions. Due to some of the unique challenges with the material, many thermoformers are not willing to take on jobs that require the product be vacuum formed out of polycarbonate. Arrowhead has extensive experience with this unique thermoplastic and is always willing to look at new vacuum forming projects where the thermoforming of polycarbonate may be required. PE is usually used where chemical resistance and toughness are required from the product that will be thermoformed. PE is generally used for high volume products that are price sensitive. Typical applications include: dunnage trays, milk jugs, food packaging, blister packs, gas cans, and outdoor playground equipment. Polypropylene is an olefin that is similar to polyethylene. In many situations, the plastic is copolymerized with ethylene, resulting in a product called Polypropylene co-polymer. Copolymerizing helps in the thermoformability of the material and allows it to compete with some higher-end plastics such as ABS. Polypropylene can have various fillers such as glass fibers added to it in order to modify its properties. Polypropylene is also used in the production of other plastics such as TPO (Thermoplastic Polyolefin). Some typical products made from Polypropylene include: food containers, RF capacitors, living hinges, plastic bags and chairs. TPO is becoming sought after by companies in many different industries. Part of this is due to good marketing on behalf of some of the first companies to introduce TPO to the market and much of it is due to the physical characteristics of the plastic itself. 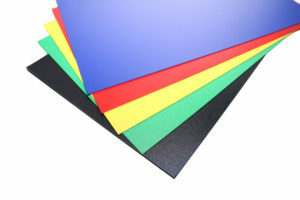 TPO is basically a blend of Polypropylene and EPDM rubber. Together, these two materials result in some interesting properties that make TPO an attractive substitute to more traditional weatherable thermoformable materials, such as acrylic capped ABS. Thermoformed products typically made from TPO include: car bumpers, rocker panels, machine covers, chemical shields, roofing membranes, engine covers, and golf car bodies. Disadvantages – Difficult to thermoform, Difficult for some sheet suppliers to extrude, Aluminum tooling required for higher volume parts (although we have developed an Eco-Tool to get around this need), High minimum quantities in some cases, Not stocked by distributors, Difficult to paint, Difficult to bond to.